When I took this one last year, the wind was buffeting my camera so hard, it was almost impossible to get a decent capture. 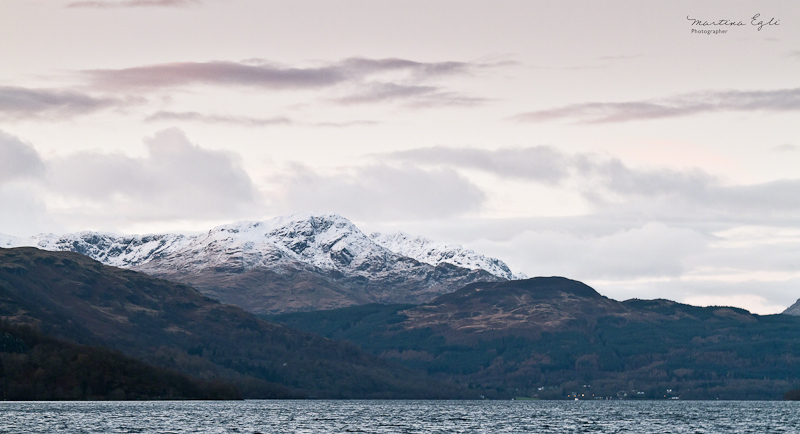 The hood on my 70-200 was acting like a sort of sail and the camera almost went for a dip in the Loch. A few days earlier I’d taken a tumble down a hillside on the trail at Queen Elizabeth Forest Park! * (Bruised ego but the camera was ok!) It can be a challenging and rewarding environment for a photographer- more than worth the effort. A fine photo despite all the adversity. The lighting and exposure are excellent. oh that’s kind of sad. I find this beautiful landscape photos and I love to see them. but I’m glad to read that you and the camera was not damaged. Very nice panoramic landscape. like the hue color between the sky and the mountain. What a superbly subtle image. I particularly like that unusual framing with just a touch of water. You surely persevered! Gorgeous lookout , truly moving. I’m am also glad your equipment was not harmed; at least we heal!